WhatsApp, Facebook, and Instagram faced a widespread outage yesterday with users from around the world reporting issues with sending messages on WhatsApp and Messenger, posting feeds on Facebook and accessing other features on the three Facebook-owned platforms. Pavel Durov, the founder of the popular secure messaging platform Telegram, claims to have had a surge in sign-ups within the last 24 hours, at the time duration when its rival messaging services were facing downtime. 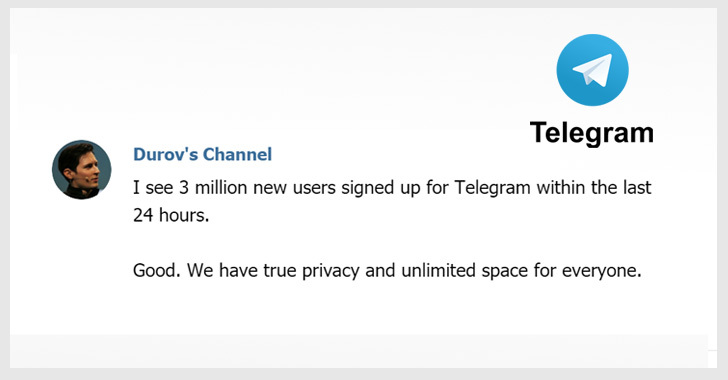 "I see 3 million new users signed up for Telegram within the last 24 hours," Durov wrote on his Telegram channel. "Good. We have true privacy and unlimited space for everyone." Telegram is an excellent alternative to Facebook's Messenger and WhatsApp services, offering users an optional end-to-end encrypted messaging feature, so that no one, not even Telegram, can access them. Telegram adopted end-to-end encryption support way back in 2013—three years before WhatsApp and Facebook Messenger. Multiple Account Support: Users can add up to 3 Telegram accounts and easily switch between them simultaneously without logging out. Create Polls: Telegram offers built-in polling feature for large communities, allowing them to coordinate their activities and discuss complex issues efficiently. The telegram has previously faced restrictions and bans in countries like Iran, as well as in its home country Russia, after Durov refused to comply with government requests for encryption keys and information on its users. "In 5+ years, Telegram disclosed exactly zero bytes of private data to third-parties including governments. That's why Telegram is banned by authoritarian governments such as Russia and Iran. Other apps such as WhatsApp have no issues with there," Durov said in a tweet. Since Durov telegram message doesn't offer any explanation for the sudden spike in the Telegram sign-ups, The Hacker News has reached out to him and will update this article as soon as we hear back.